NEW ORLEANS – Which of the three Men’s Finalists and three Women’s Finalists do you think should win collegiate track & field’s highest individual honor, The Bowerman Trophy? Starting today, track & field fans around the world will be able to make their opinions known as the annual fan vote component of The Bowerman selection process is officially open at THEBOWERMAN.ORG. Fans will choose between Edward Cheserek of Oregon, Lawi Lalang of Arizona and Deon Lendore of Texas A&M for the men’s trophy, and Sharika Nelvis of Arkansas State, Courtney Okolo of Texas and Laura Roesler of Oregon for the women’s trophy. More information on each Finalist can be found by clicking their names in the above paragraph. 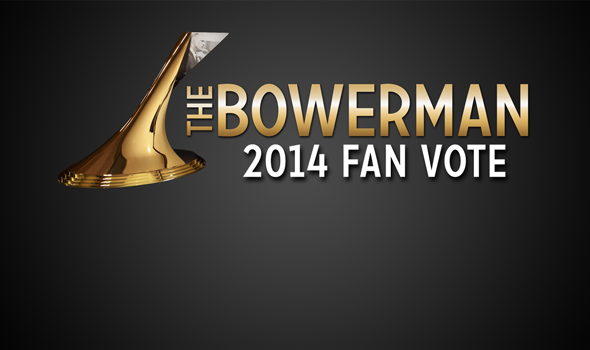 Once fans cast their vote, they can spread the word about their favorite Finalists and encourage their friends to vote by sharing the link to TheBowerman.org, mentioning @TheBowerman on Twitter and/or “The Bowerman” on Facebook, and using the hashtags #VoteCheserek, #VoteLalang, #VoteLendore, #VoteNelvis, #VoteOkolo or #VoteRoesler. Posts containing these hashtags will not count in the overall vote total. More than just bragging rights are at stake in the fan vote. The results will count in the overall voting process as one vote alongside those of the nation’s top track & field media members, statisticians, administrators and coaches. When placing votes, fans should only consider performances that occurred from the beginning of the indoor season through the end of the NCAA Division I Outdoor Track & Field Championships. Any performance that occurred during that timeframe — even if it wasn’t a purely collegiate competition — can be counted. Anything before that time (cross country) or after (USA Championships, select Diamond League meetings, etc.) should not factor into the decision. Online fan voting started in 2009 with more than 200,000 votes having been cast since, and more than 25,000 votes have been cast each year. Last year saw more than 36,000 votes cast as Julian Wruck of UCLA and Kori Carter of Stanford earned the nods from the fans. Paper balloting by The Bowerman Advisory Board, past winners, selected media personnel, statisticians, and collegiate administrators, is also underway until August 12. An independent accounting firm will collect, tabulate, and certify final results and will keep the result secret until the envelope is opened in December. The award, in its sixth year of existence, will be presented in a ceremony at the USTFCCCA Convention on December 17 at the JW Marriott Phoenix Desert Ridge in Phoenix, Ariz.
Paper balloting will conclude in the coming weeks while online voting will begin on Monday, July 28 and will last until Tuesday, August 12. An independent accounting firm will collect, tabulate, and certify final results and will keep the result secret until the envelope is opened December 17 at The Bowerman Trophy Award Show. The Bowerman Trophy, which was first awarded in 2009, is presented annually by the USTFCCCA to the most outstanding male and female collegiate track & field athletes in the nation. Indiana’s Derek Drouin and Clemson’s Brianna Rollins are the reigning winners of The Bowerman, which is named for legendary Oregon track & field and cross country coach Bill Bowerman. In addition to their collegiate achievements, Rollins is the reigning World Champion in the 100 meter hurdles — an event for which she also holds the American Record — while Drouin has won bronze medals at both the 2012 Olympics and 2013 IAAF World Championships. Past winners include Olympic gold medalist, World Champion and decathlon world-record holder Ashton Eaton (2010); 10,000-meter Olympic silver medalist Galen Rupp (2009); and 2011 IAAF World Champion at 1500 meters, Jenny Simpson (2009). In total, the winners from the award’s first four years have won three Olympic Medals, six World Championships (one relay, two indoor) and 11 World Championships medals (two relay, one indoor). When considering finalists for the award, 13 individuals have earned a combined six Olympic medals, eight World Championships (one relay, four indoor) and 23 World Championships medals (three realy, six indoor). Former winners of and finalists for The Bowerman currently hold 20 national records. Each former winner of the men’s Bowerman Trophy holds at least two national records, while one of the five women’s winners is a current national record-holder.